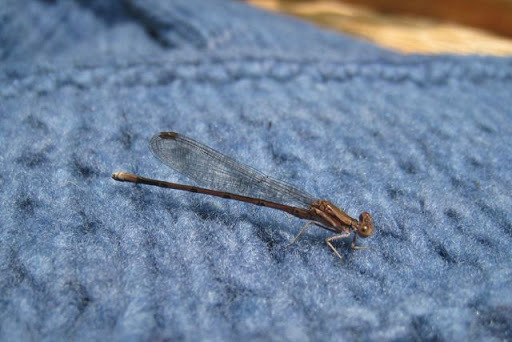 A little damselfly paid my hat a visit! I was sitting there last night, about to begin to knit on a sock, when I heard some yarn talking to me. It was Catskill Merino, which Clara at Knitter’s Review wrote about a few weeks ago, and which had arrived on my doorstep “by accident.” I listened carefully as the yarn — a soft, plump worsted weight singles dyed with indigo — asked to be knit into something right away. 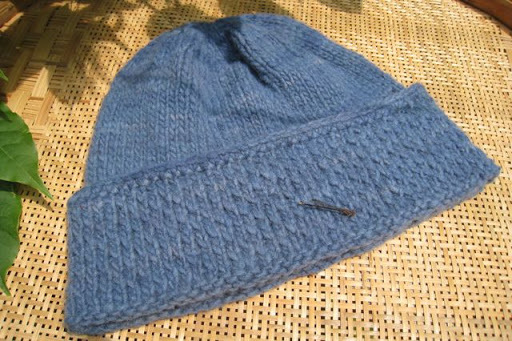 So I cast on a Honeycomb Hat from The Knitter’s Book of Yarn. By this morning it was off the needles, so I washed it and set it out on my little deck to dry. I love this yarn! It’s not a true single, because up close you can see that two strands have been twisted together, but it behaves like a single, and I’m sure that it will pill with abrasion. It’s just right for a soft, warm hat. I’ve made one of these before, and it’s my favorite hat to wear. 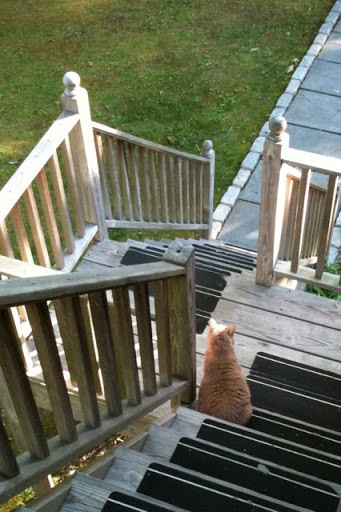 A few days ago Annabelle ventured down the stairs, but something across the driveway made her turn around just after I took the picture. From this angle her rear end doesn’t look too ample, so she said I could post this. She’s very careful about such things, you know. She rarely goes outside; she wants to, but she doesn’t like to, so every once in a while I let her try it. She lasts about three minutes, on average, which is just fine with me. 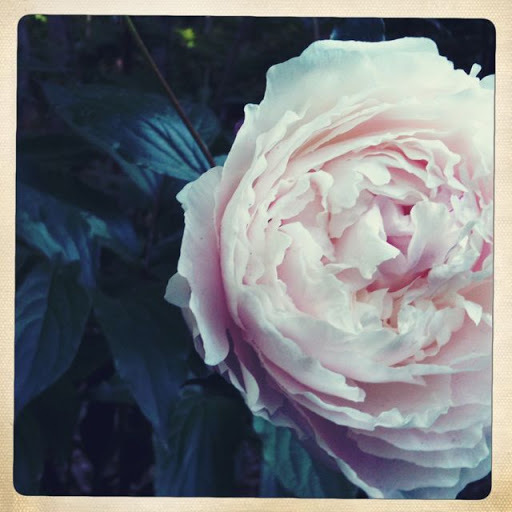 In another “right in my own back yard” moment, about ten days ago I took this picture of a pale pink peony. I like what the Hipstamatic iPhone app does with color. It looks so old. Ten days? What have I been doing? Working. The store move is complete, except for a couple of shelves that are still being built, and we’re about to enter the real Summer Season. In any spare time, I’ve been resting up and knitting. 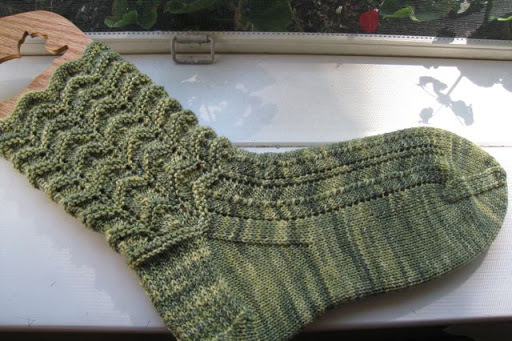 I had been plugging away on this pair of Celebrate Spring socks in Sundara Sock Sage over Butter, but the second one is on time-out. This one just doesn’t fit right (I think it’s the unforgiving rows of purl stitches that go right over the biggest part of my big ankle), and I’ll need to think about it before I proceed. I still have socks going on, though. 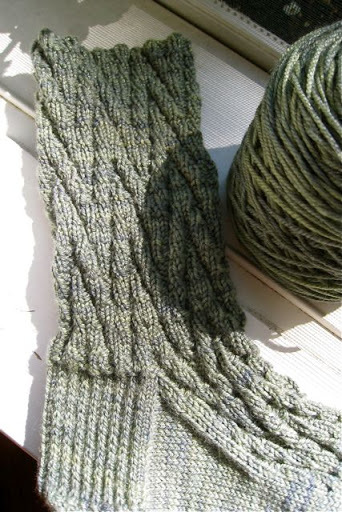 My friend Kristopher and I are having a little Summertime Sock Knitalong, just the two of us. We decided on a pattern (Anne Hanson’s excellent Dolomite Socks), made a “rule” that we had to cast on with a yarn in our stash that we haven’t used before (that’s easy, but it meant No Sundara for me), and off we went. My yarn is Frija from Spirit Trail, and Kris is working with Briar Rose Grandma’s Blessing. This pattern is nice and stretchy, and easy to memorize. The yarn is lovely — it’s merino, cashmere and a little bit of nylon. Knitting will keep me going all through the summer, as it always does. There have also been quarts and quarts of local strawberries, my other early summer salvation. I froze most of them for later — smoothies in August! I’ve been trying to reclaim my reading mojo, which left a couple of months ago (distressing, when you sell books for a living). I’m reading Simon Van Booy’s short story collection, The Secret Lives of People in Love. He’s brilliant — his stories really are like poems, as Roger Rosenblatt is quoted on Simon’s website. He’s also a frequent visitor to the bookstore (as is Roger; we’re so lucky! ), and he’s coming to read and sign books this Saturday. Stop by if you’re in the neighborhood — 5:00pm on Saturday the 19th. The hat should be dry by now, and my socks are calling. Another Sunday off is coming to a close, so I want to make the most of what’s left. Lovely hat and socks. The hat looks snuggly and warm. No one wants a photo of their ample rear end posted on the internet. 😉 Katie Cat rarely ventures past the front porch if I let her out. She wants to go further but she gets nervous, especially if she thinks I'm going to shut the door. The pic of Annabelle – fabulous. And the yarn and your projects. Jane it is so wonderful to have you back at full blast. It is truly wonderful. Love you. I love how the little dragonfly approves of the hat too! I just love dragonfies! A week or so back when my friend Carolyn was visiting we were sitting on the back deck looking over her scrapbook of Ireland when one landed on the page right in front of my nose. I think it's supposed to be like a blessing when one honors you with a visit.Lovely knitting! I usually put my needles down for the duration of the summer; not quite sure why! On second thought, it might be a damsel fly instead .. ? Busy, busy! All your knitting projects look great and love that photo of Ms. Annabelle. Lovely knitting; lovely kitty; lovely peony. And thanks so much for the book suggestion. I'm always on the lookout for something new and interesting to read! Oh happy sigh… that Merino, that hat, that damselfly, that peony, that Annabelle… I want to wrap myself up in the world that is this post.